Stealing small amounts of food to stave off hunger is not a crime, Italy's highest court of appeal has ruled. Judges overturned a theft conviction against Roman Ostriakov after he stole cheese and sausages worth €4.07 (£3; $4.50) from a supermarket. 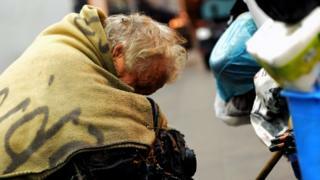 Mr Ostriakov, a homeless man of Ukrainian background, had taken the food "in the face of the immediate and essential need for nourishment", the court of cassation decided. Therefore it was not a crime, it said. A fellow customer informed the store's security in 2011, when Mr Ostriakov attempted to leave a Genoa supermarket with two pieces of cheese and a packet of sausages in his pocket but paid only for breadsticks. In 2015, Mr Ostriakov was convicted of theft and sentenced to six months in jail and a €100 fine. For the judges, the "right to survival prevails over property", said an op-ed in La Stampa newspaper (in Italian). In times of economic hardship, the court of cassation's judgement "reminds everyone that in a civilised country not even the worst of men should starve". An opinion piece in Corriere Della Sera says statistics suggest 615 people are added to the ranks of the poor in Italy every day - it was "unthinkable that the law should not take note of reality". It criticised the fact that a case concerning the taking of goods worth under €5 went through three rounds in the courts before being thrown out. The "historic" ruling is "right and pertinent", said Italiaglobale.it - and derives from a concept that "informed the Western world for centuries - it is called humanity". However, his case was sent to appeal on the grounds that the conviction should be reduced to attempted theft and the sentence cut, as Mr Ostriakov had not left the shop premises when he was caught. Italy's Supreme Court of Cassation, which reviews only the application of the law and not the facts of the case, on Monday made a final and definitive ruling overturning the conviction entirely. Stealing small quantities of food to satisfy a vital need for food did not constitute a crime, the court wrote. "The condition of the defendant and the circumstances in which the seizure of merchandise took place prove that he took possession of that small amount of food in the face of an immediate and essential need for nourishment, acting therefore in a state of necessity," wrote the court.